I had a little meltdown, but I think God is trying to tell me something about my priorities. I need to study His Word and spend time with Him. I have been too focused on short term stuff, and lose Him. And then I lose joy. And I turn into a jerk. Which is not good for the kiddos. Or me either. Its so hard to give up little pleasures for Him, but this is also indicative of the state of me....that I am close to my little pleasures and hobbies, but far from Him, so its giving up what is near and cherished for a Stranger. But I need to flip that. God has to be closer to me than my little pleasures, so that they pale in comparison to Him. Daily Bible Reading & Study. Keep it simple 5 readings a week, taped to the wall and I highlight it when I do it. That way if I "fail" for a couple days, perfectionist me doesn't decide I "ruined the whole thing" and give up. Daily Time with God. At least15 minutes a day of bringing Him my worries, just listening and journaling (because I get less distracted when I'm writing Him letters). Also praying through a list of people every day. It sounds really lame, but I'm going to make a little chart for this too....because I need accountability for myself. Bible Study with Josh. Every evening, at 10:30 at night, we will spend at least 15 minutes on a Bible Passage, studying it together. We met in a Bible Study, and I like how different than mine his brain works. I always mean to "spend more time" really spending time with the kids and not just keeping them alive/fed/clothed etc. But I tend to zone out and do things with them while thinking about something else. I need a schedule. And a highlighted chart, because I need accountability and structure like that. Start Homeschool. [Right after 2nd Breakfast] Start Isaiah with the Reading Program, and have the kids work on letters and numbers and simple math problems. Reading, Writing, Arithmetic. Even 10 minutes a day, every day at the same time, say after 2nd breakfast, is something to start with. Then do arts & craft with the kids. It can be stressful, as they wield paintbrushes, etc, but make an effort. Every day, either paint, crayon, marker, do a project, etc. with them. Even if its just 10 minutes after their 3 R's. Hang out with them, intentionally. [Right after Baby's Naptime]. Focus on them. Just spend an hour hanging out, not trying to get laundry done, or sitting in the corner planning projects while they play, but just focusing on them for at least an hour, engaging them in conversations and playing along with them. Need to find a good time. Read them at least 7 books a day. FIX A TIME. (2 of which should be about Jesus). Go on a walk with them every day. [early morning, right after/before Breakfast] When the weather is no longer like the surface of Mercury, I will walk with them every day, preferably at 7 or 9 am. Rocking Chair Time. [Right after Bedtime/Prayertime] My mom did this with us, and it was one of my most cherished memories. Should would have each of us take a turn, in which she would rock you in the rocking chair and sing you a song of your choice (usually "Morning Sun"), every night. I think God did give me a tendency & desire to write stories, and I think He wants me to do this. Often a picture will come into my head, an idea, and refuse to go away, just waiting. I know I've had this desire in me to write stories that show how big the sky is....how much meaning and love and poetry God has written even into this fractured universe. But for the most part in the last few years, I've pretty much focussed much more of limited spare time into other things (like making clothes and crafting with wire, or finding deals at thrift stores) which are good things, but I would be dissapointed if at the end of my life I had spent my free time on those things and never finished those unwritten stories that keep coming back to me. I also really want to be a part of helping out with my sibling’s stories, which I think have the potential to make this world a better place…because stories can open our eyes to beauty and truth. I also want to learn how to illustrate Children’s books, and write the children’s books that I want my children to have. There don’t seem to be nearly enough of the kind I want to read to them, and I know how pivotal children’s books (with beautiful illustrations) were to shaping my sense of wonder about the world, especially the ones I had read to be before I was 6. Isaiah is 4 already, so I’m on a clock here…. Prodigal, Ambertstone, Where the Lilies truly grow, and other stories. These are concrete things, I create with my hands. I don't know why, it gives me so much more satisfaction than doing other necessary (yet cyclic) things, like laundry, or cooking/baking (because it all disappears...), etc. But I do have lists and lists of things I want to do, and have spent so much time/energy thinking about it. I need to be more realistic & responsible with how much time I set aside to do this, but also (ironically enough) be more disciplined about actually doing them. Arwen Dresses (Everyday LOTR) Half sleeve Bloodred Gown [sheets], Bridge dress half sleeves [sheets & chiffon], Green dress [need HL fabric] with chiffon BIG sleeves. Peplum Tops (Simplicity, no collar, French cap sleeves) white & cream sheets. 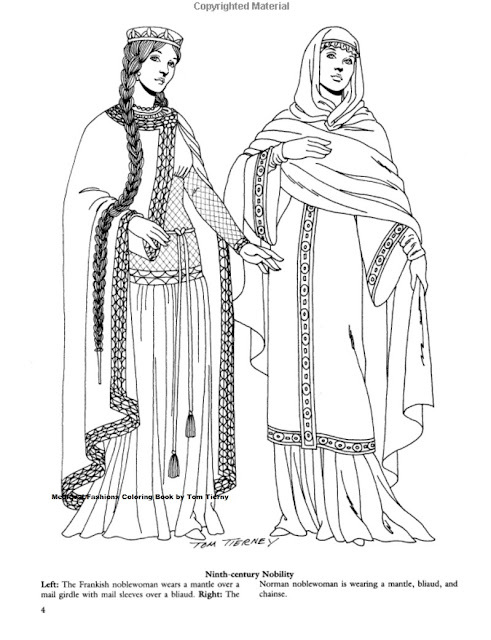 Print/finish Gondor Tunics for myself, Gondor Tunics for the kiddos, Print kid’s T shirts, etc. 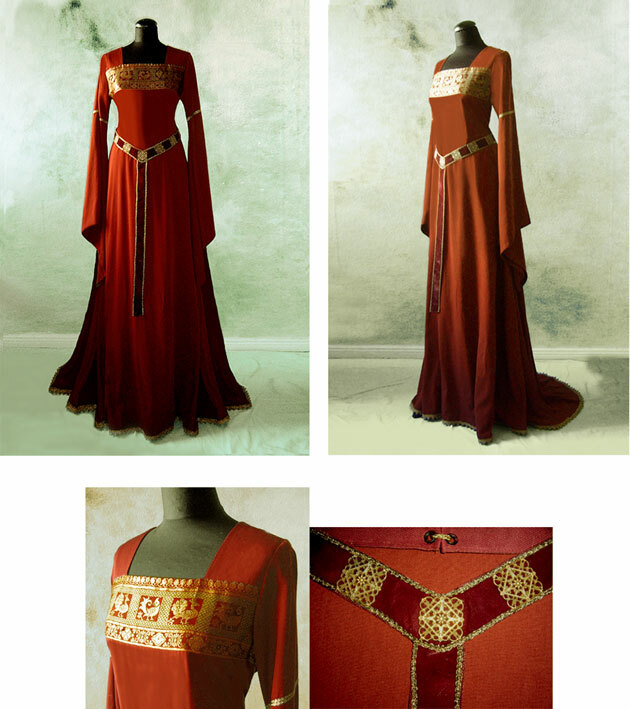 Bex Red Arwen Dress from her sheet. Women: Rub Off Simple elastic-waisted red dress. Square Neck Empire Puffed Sleeves, Dk blue w/ cream or white lace at neck. I made it from a cotton IKEA tablecloth that I picked up at a thrift store a while back. The center stripe and facing are sort of medieval-inspired that I sketched up. I guess kinda like this picture of Ninth Century dress by Tom Tierney, the dress on the right. I added gold accents, because gold and blue together look so medieval to me. In sunlight, you can see the gold a little better. Aunt Bekah got to visit for a week. It was a lot of fun. Isaiah got to hear Beowulf again. And eat a lot of peaches. And watch Star Wars Rebels season 1 through at least 3 times. She was kind enough to model some old sewing projects for me, that I sewed this year but never got round to photographing. Here is my standard T-shirt. I like cap sleeves, v necks, and fitted but not too fitted. I make them from T-shirts from the thrift store, because its so very much cheaper than buying knits new. Here is an apron I made in May. I love aprons. You can wipe kids jammy fingers on them, you can scoop up and transport laundry/toys/oranges, etc in your skirt without flashing people. They are so handy, and erase the extra stress of worrying of getting tomato sauce/peanut butter/dishwater on your favorite clothes. I based it off of Richard Scarry's picture of Grandma Bear's apron. Given how comfortable it is, I assume it must have been a standard type of apron back in the days when women wore aprons a lot more (Grandma Bear is always wearing her apron). It is SOOO comfortable. See how the neck straps come down the back. Here is an example of the apron on Mommy Cat. I love aprons, but I hate feeling something pulling on the back of my neck (like a halter top) it makes me feel like I'm being choked. This apron's design is very good, its shoulder straps cross across the back and then connect in a wide X to the sides of the apron, bearing the weight very nicely. 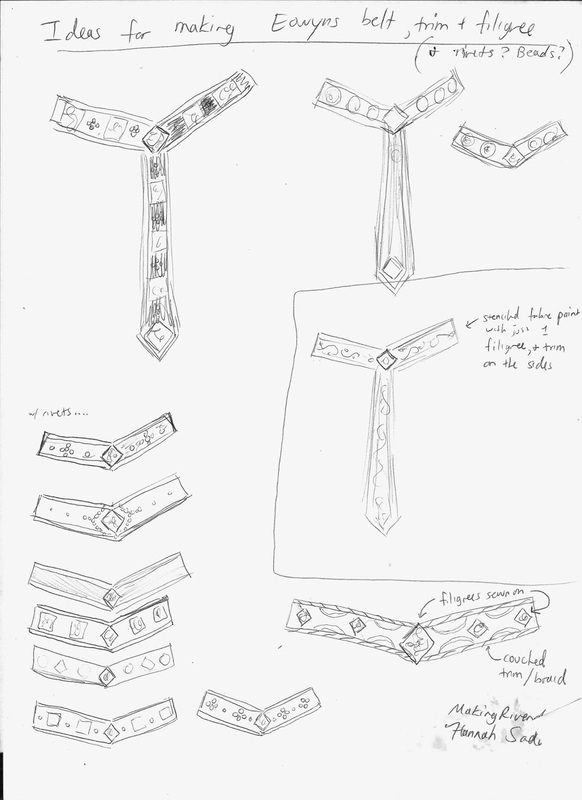 The fit can be adjusted by the standard ties on the sides. Here is a write up of the measurements I used. It was simple and straightforward to make, basically the waistband is a long rectangle that you iron in half lengthwise, inserting in another rectangle that you gather to be the bottom half of the apron. Then you sew the waistband's edges down and it holds the skirt part in. If you stop here its a half apron. To make it a full apron, I just sewed another rectangle (the top part) with 2 wide straps onto it. Then tried it on, pinning the straps accross my back, and then cut and sewed them to the proper place. Its all rectangles and straight seams. Ironing helps it go together very easily. I got 2 half aprons and one full apron out of a nice weight cotton sheet. I'll update this post with links to the finished belts as I make them. I've been trying to figure out how to make Eowyn's Medallion belts for a while. Here is my write up and analysis of how to make Eowyn's belt. There's a full analysis on the alleyscratch website, which all these pictures are from. Alleyscratch has a very good analysis, with diagrams and breakdowns of the medallions' constructions. link to full page here. 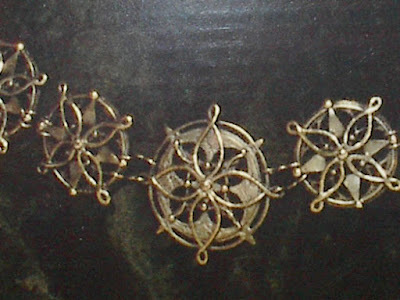 The medallion belts are made of 2 medallions, a bigger central one, and a smaller side one. Here are some nice fan-made examples that I have analyzed. Yvette (check out her amazing Arwen dresses, especially this one, scroll to the bottom of the page...) made them from metal clay and silver wire (scroll down to the bottom of the page to see them). 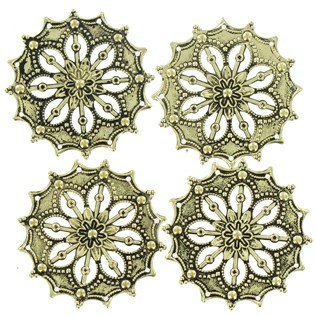 I don't think its necessary to make them from metal clay or silver wire, since baking the clay seems to tarnish the wire. Also, if you are going to paint it anyway, there isn't a need to use metallic clay. In my past obsession with wire-work, I've found steel utility wire is a lot cheaper than craft wire, and can be bent well with 2 pairs of pliers. But if you want something that is really easy to bend with your fingers, skip the copper and get aluminum wire (which is still cheaper copper). Yvette's version is lovely, and I like how she spaces the medallions nicely, it really gives it a medallion feel. Things I would do differently, is I like the medallions to be bigger, giving a visually thicker belt (which I think is slenderizing on fuller figures). 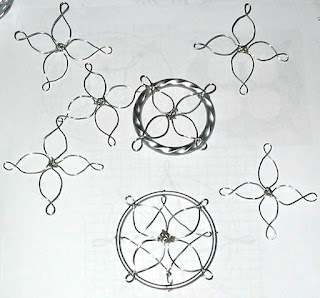 I also would use a gauge 16 wire at least, as I think gauge 18 and above are a little thin for my taste, I like the wire flower loops to have more "pop." Print my Props version---3D printed plastic. link to etsy shop here. Mia's costume Site Violyns.tripod.com---metal rings and wire. LINK HERE. 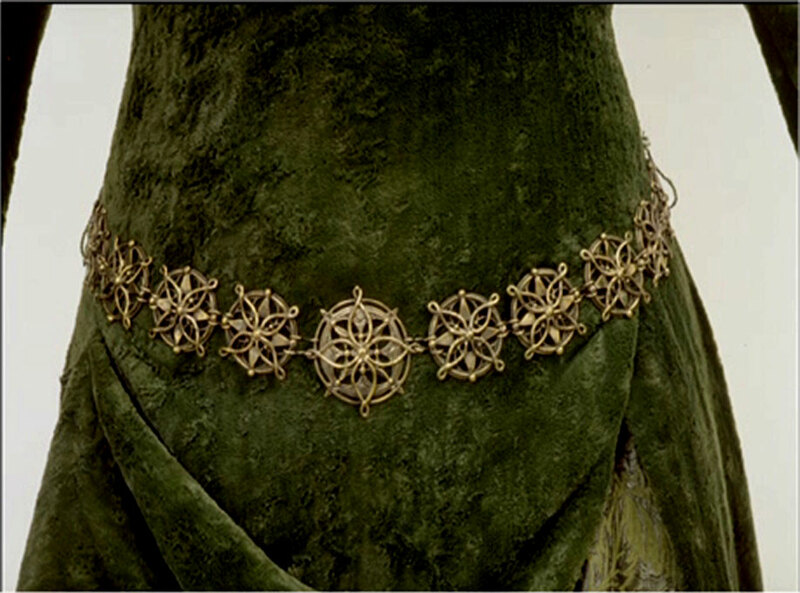 This captures so much of the feel of Eowyn's belt, using instead of medallions, metal rings which the wire then is strung into, and spray painted. Quite well done. LINK HERE. 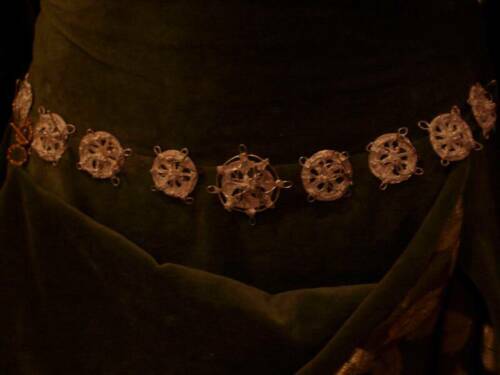 I like especially how she translated the medallion shapes to wires. I also like how nice and plump she made the "petals" of wire. The finished look is quite good. I think the openness of the rings works especially well in the white belt version, since it works more on a lace-like feel. LINK HERE. I think this captures the most of the spirit of Eowyn's belt without having absolute screen accuracy. 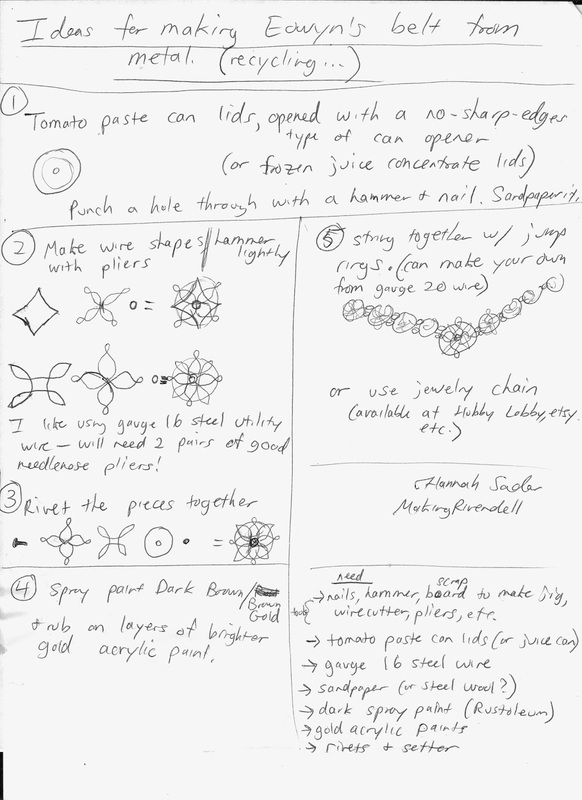 She simply strung together filigrees with jump rings (and also painted it a bit). Pictures of her dress are here, her write up of the making of here. It's real metal, so feels more authentic, and looks awesome. Filigrees are very thin stamped metal, that looks kinda like lace. Etsy is full of various filigrees, Hobby Lobby also has a fair amount. 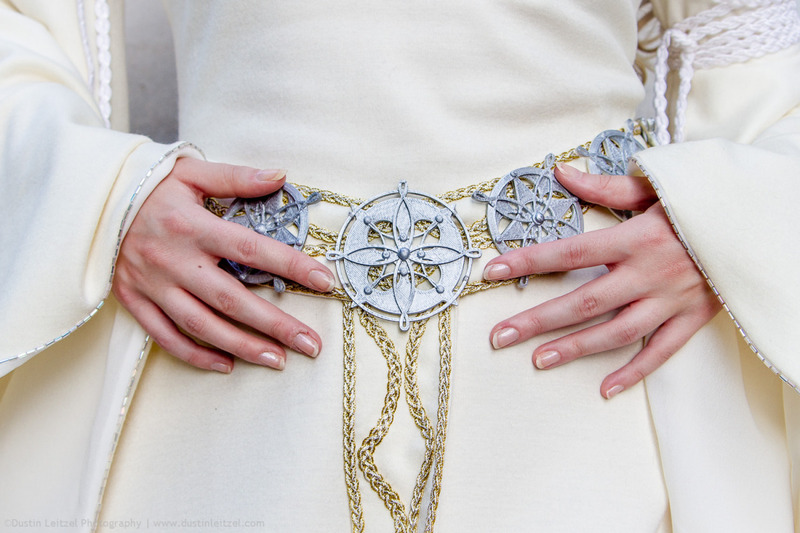 I think this one especially looks reminiscient of Eowyn's belt. I wish it were just a tad larger though. I am going to make one using these filigrees. 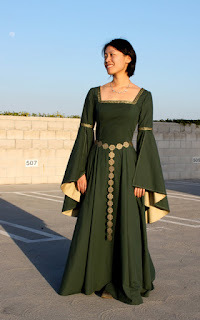 You can either string them together with jump rings and a lobster clasp (like her Green Gown belt) or sew them onto a fabric belt with trim/beading (like Eowyn's white wool gown belt) which gives you the option of more visually thickening the belt, if you would like. Ideas for making Eowyn's medallion belt from Plastic and aluminum wire. If you are going to go the plastic route at home, I would think a good start is to look at the alleyscratch break down of the medallion, and cut out the base metal part from plastic sheeting with a utility knife (on a glass cutting mat!). You could use yogurt lids, or pretty much any rigid plastic in the recyclying bin. Or craft foam. I would like to do it with something a little more rigid than yogurt lid plastic, maybe the bottom of those big plastic icecream tubs??? If you have an idea, please let me know in the comments! Then you'd sand the plastic pieces with sandpaper, to make them more textured (and hold paint). 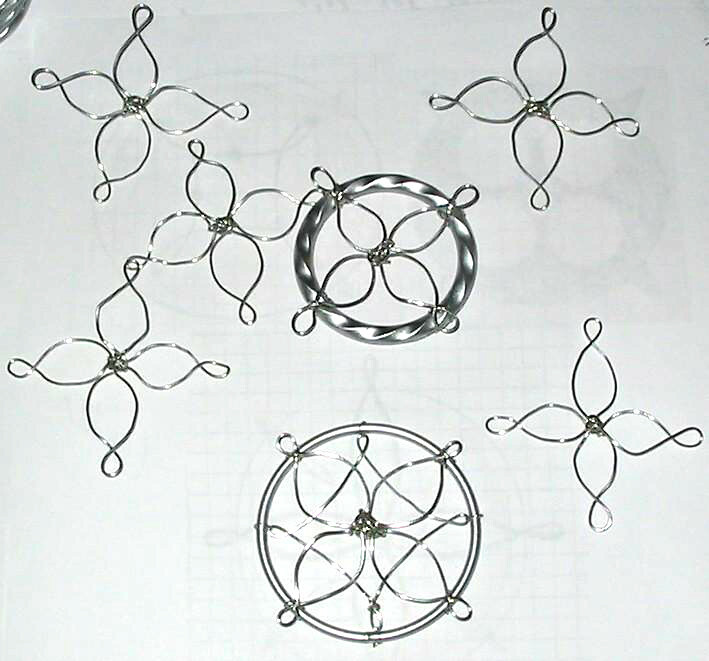 The wire parts I'd make from gauge 16 or 14 aluminum wire (since the plastic is soft anyway), lightly hammered. I want to use thicker gauge wire, because to me, a lot of the beauty of the belt comes from the wire loops not looking spindly. 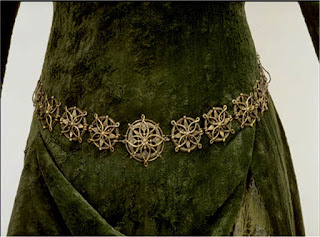 Ideas for making Eowyn's medallion belt from metal...recycling & steel utility wire! Cold forging!! You would punch the hole through the center with a hammer and nail (scrap wood underneath). This hole will be for the rivet, to hold it all together. I've found with thicker gauge steel wire, the best shaping I get is with careful measuring, and using 2 sturdy pairs of pliers. I'd hammer it (carefully) lightly afterward, to help it keep its shape. The "seam" where the wire ends meet, will be at the center, where they will be covered up with the rivet. I'd use real sturdy Tandy type of rivets for this, since I'm not as afraid to bang it with a hammer since its all metal. Painting it, I'd spray paint it with Rustoleum matte dark colored spray paint, then build up brighter layers of gold with acrylic metallic paints and a rag. Lastly, I'd string it together with jump rings. 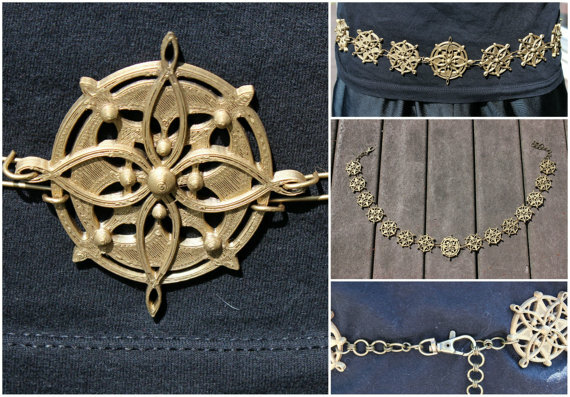 This belt will not be screen authentic as it won't have large decorative holes in the medallions (if you had a punch and die set, you could do this easily), but the trade off is worth it to me to have something all metal, versus metal and plastic. 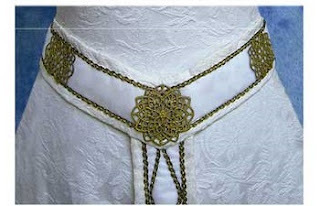 Ideas for making Eowyn's medallion belt from filigrees and fabric trim. Check out their galleries, they're beautiful. Gorgeous dress MORE PICTURES HERE. From redrose-online.de HERE,. This is under this gallery. I love how visually thick it is. The neckband is amazing too. And the belt on this is just...wow. From redrose-online.de HERE (this is under the historic gallery) I just love how they used the square medallions, matching the color perfectly with the trim on the dark red. I think I am going to try something like this, on a brown or black velveteen fabric. We'll see. These ones from Fashionsintime are pretty good too. 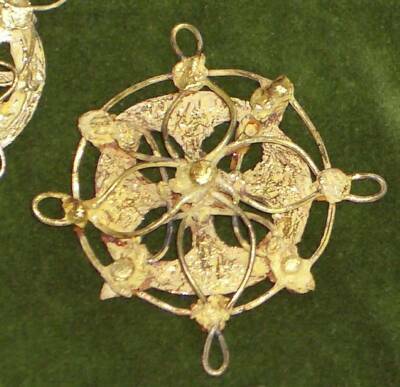 Although I think those are more medallions and not filigrees. 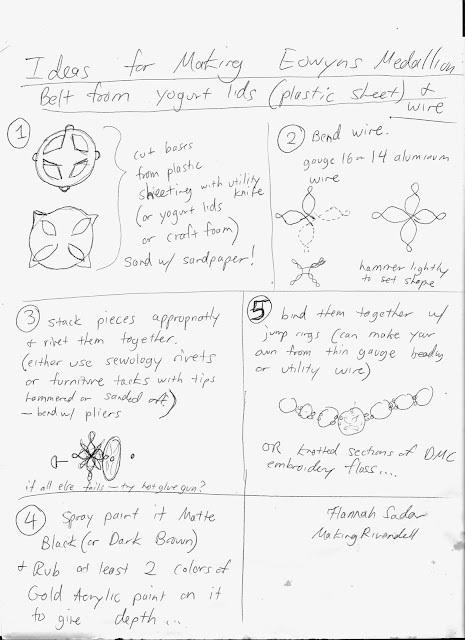 So here are a few of my ideas. 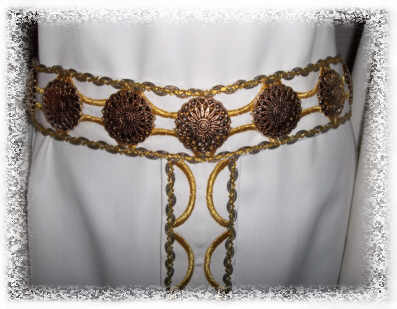 You would use trim or braid, sewn with thread onto the fabric (a techinque called "couching"). 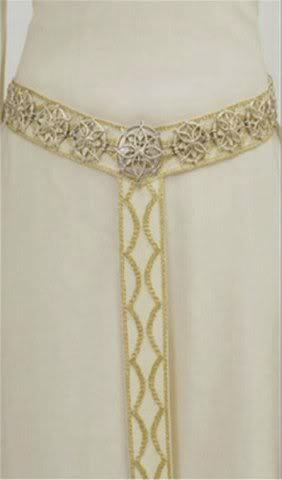 You would sew the filigrees on, and could even do rivets or beading if you were feeling up to it. One of the advantages of this method is you could control the visual "thickness" of the belt, even if your filigrees were small, by how you placed your trim or braid. I'm even considering using my stencils and fabric paint for the central fabric part of the belt, with the filigrees sewn on in strategic places as accents. I'd border the whole thing with trim or braid. He was pretty excited, as he's been singing "Happy Birthday" over stuffed animal birthday cakes in anticipation of this day, for at least a month. There was a cake, I decorated. He got a Norman helmet, and Starwars Rebels Legos, as well as books and a movie. I came in later, and found this. Josh wearing Isaiah's helmet per his request. He's growing up. As he tells you now, he is four. He has so much unbridled joy over certain things (playing Legos with Daddy, getting tickled, watching "STAR WARS! ", building the Avengers Puzzle with Daddy, or while watching the Donut Man) that sometimes he leaps around laughing for joy.